Beets are naturally high in nitrates in which the body changes into nitric oxide. This helps with blood flow and contributes to reduced blood pressure. Improves muscle endurance. From the BeetBoost website, more oxygen rich blood also helps muscles – including the heart muscle – work more efficiently too. When muscles work more efficiently, they don’t burn as much oxygen, resulting in more power with less effort. People report higher endurance levels and faster recovery after exercise. Improved mental clarity. The BeetBoost website also states that nitric oxide increases vasodilation(widening of blood vessels) increasing blood flow to your brain and improving mental clarity. Nitric oxide also facilitates sleep by allowing you to achieve REM sleep more often due to increased elasticity of blood vessels. BeetBoost is unique in that Beets is not the only ingredient in it. Tart cherries is the second and only other ingredient. Get this, tart cherries have been proven to speed up recovery in endurance athletes. I did not know this. Tart cherries contain anti-inflammatory nutrients. Here’s a link to an article from running.competitor.com. From the BeetBoost website, the tart cherries found in BeetBoost contain phytonutrients called anthocyanins, which are antioxidants which help manage muscle and joint health. There are no added sweeteners, flavors or anything else. It’s pure natural. Each serving contains 6 medium non-gmo beets and 35 tart cherries. BeetBoost seems to be a great way to improve performance as well as aid in recovery. I’ve been hooked in and will be testing it out longer. One lucky reader will get to win a box of BeetBoost. This giveaway is open to US residents only. It starts on March 11 and will end on March 19. Enter the Rafflecopter giveaway HERE! For more info on BeetBoost, check out http://beetboost.com/. There’s been a lot of research done on Beets. Here are more links to articles that I came across: WebMD, running.competitor.com, active.com, fellnr.com, shape.com. Have you tried BeetBoost, or beet juice for increased performance or tart cherries for recovery? Be sure to head over to Running with SD Mom and Erica Finds for even more giveaways to #WinAllThePrizes. I really enjoy red beets so I think I may like this! Thanks for sharing. I’m intrigued…but I don’t like beets so I’m not sure I’d like this one! It is a great combo, beets and cherries. You won’t know unless you try it. Always looking for an edge. I do like beets! And I’ve done tart cherry juice (when I remember, which isn’t often). I hear ya. Good luck in the giveaway! That beet cherry combination is really interesting. Have a good race! It is an interesting combo. Thanks Courtney! Have a great weekend! This sounds good! I have not tried this and will have to give it a try! There’s so much research backing Beets improving performance. Hope you give it a try! To me it is more of a cherry flavor. It’s light. I haven’t had beets really before this so I’m not sure how to compare it. My husband thinks beets taste like dirty, but I love them! I’ve been interested in this stuff since I heard it mentioned on a Jillian Michaels podcast. Thanks for sharing! Great to know that you love beets! Hope you try it out! You’re welcome. I have been starting to roast beets more often because I keep hearing how good they are for performance. I have also tried tart cherries for fuel during a half marathon. I liked it. They were easy to eat while running. 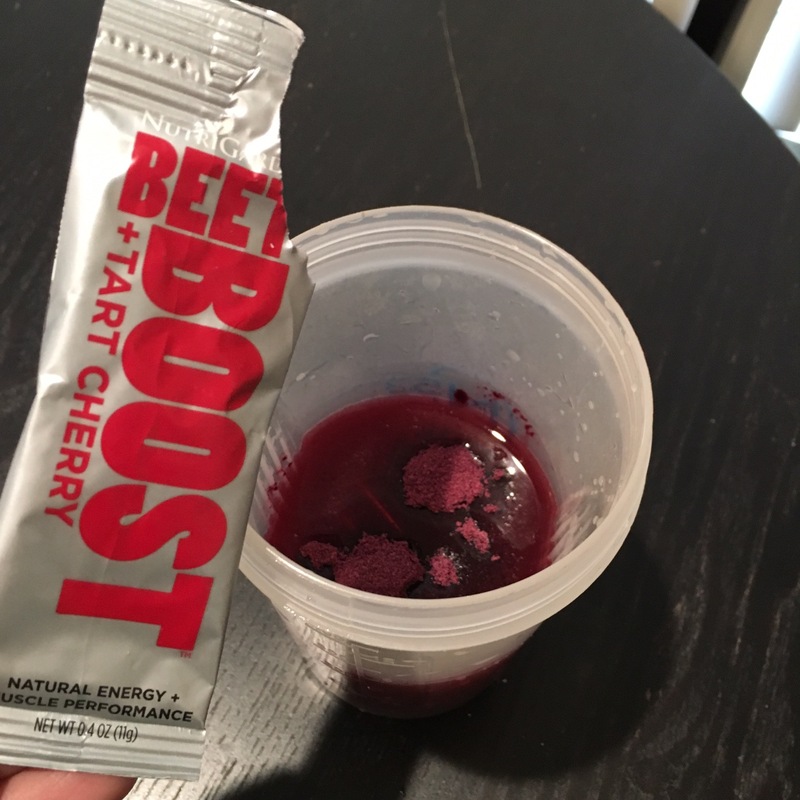 I have never tried beet boost though – looks great! This is my first time trying a beet product. This is a great combo with the tart cherries. Good luck in the giveaway! Awesome that you love beets! Thanks for entering and good luck in the giveaway! I will have to try this , hopefully soon. This sounds intriguing! It’s worth a try. Yes, definitely worth a try. It’s such a great combo of ingredients. This hasn’t come to France yet… hmm, sounds interesting. I think they ship internationally. But unfortunately this giveaway is for U.S. residents only. I have read about the great recovery effects of beets and cherries 🙂 Great giveaway! I’ve not tried beet juice or tray cherry juice for recovery but I’ve read great things about both. I hadn’t tried them until now and I’m loving it! Good luck in the giveaway! I’ve had beet powder and tart cherries, but never together like this. Great idea! Yes, it’s a great combination! I have never tried this product, but one a week I make a beet, apple and spinach juice that is delciious! Sounds great! Good luck in the giveaway! Nice! Sounds great in smoothies. I love beets, but I’ve never tried any Beet Boost products or beet juice. I’m definitely interesting in trying it! Awesome! Hope you get to try it out! Thanks! Awesome that you won a box!